€37 versus €7 ... which would you choose? MUA were brazen with Undressed but w7 are being just plain bold. Imitation is supposed to be the highest form of flattery, and yes the popularity of the perfectly put-together Naked pallets have meant more beautiful more affordable neutral palettes on the open market, but there's taking inspiration and there's taking the biscuit. So let's call a dupe a dupe and compare Naked 2 with its latest doppleganger - the w7 In The Buff palette. There's no denying, they weren't trying to hide their inspiration when w7, a brand that hovers comfortably below the radar boasting a range of 150 nail polishes and a line-up chockablock of copy cats, came up with In The Buff. There's no denying it - but how well have they done? Well on price alone there's almost €30 in the difference - depending on where you buy it. Those near a Cara Pharmacy should be able to pick an In The Buff pallet and have change for a tenner, while you'll need to hit up the ATM for Urban Decay. Does quality suffer at the expense of a bargain? Well, not as much as you'd think. 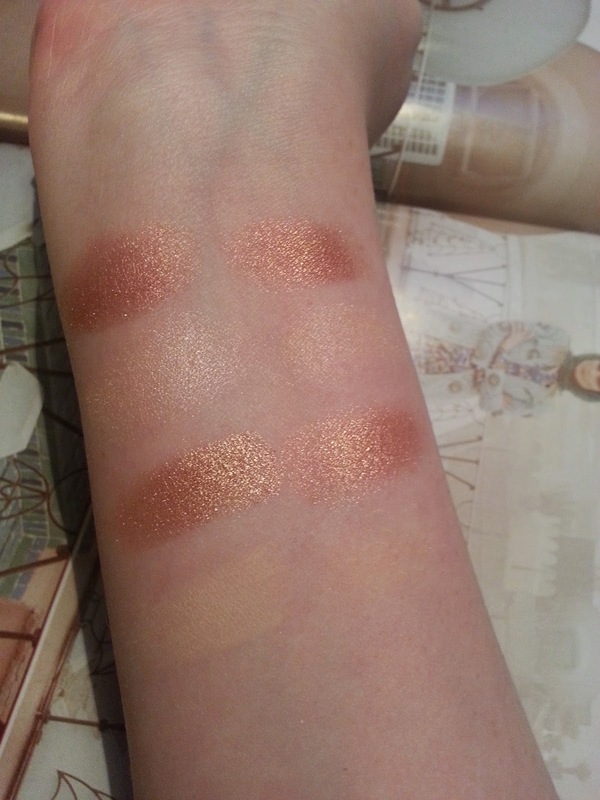 Eyeshadows are not the pigment-less chalky horrors of years ago, people are investing in higher end colours so the budget brands have had to up their game. The glitter isn't as fine, the fall out a little trickier, blending is possible but not always perfect - but you know, it's not half bad at all. Left - Right : Urban Decay - w7Urban Decay, moving upwards, Foxy - Half Baked - Bootycall - Chopper. w7: Buff - Camel - Sand -Dust. Foxy/Buff is a write-off. w7's offering is dusty to say the least, it doesn't give the same ready-to-blendy base that Foxy does. Half Baked is one of my favourite UD shadows, so I never thought anything could compare to it. Camel doesn't fair too badly. The "shimmer" is little more glitter than glisten, but it's all there. Bootycall is another personal favourite, the ultimate shimmering champagne and I'm sorry but Sand just doesn't do it for me, but it's a valiant effort. Dust isn't a bad match for Chopper, although it's a little more bronze/brown than the rich copper of UD. But not bad at all I must say. The matts are so far letting me down. Harder to hide I think with a matt, you really need the quality behind it or it all goes to pot. Tease is a wonderful crease colour, typical of the taupey tones of the pallet, but Chocolate isn't up to parr. It clumped, it was chalky and far from what I looked for. Snakebite is another classic and an old favourite. Topaz isn't far off although it has a slightly more golden tone rather than silver. Earth is a very good match for Suspect, a colour that really doesn't get enough love. Pistol is one I never thought I would see matched, but Storm is close I'll give it that. Not quite the same intensity but multicolour micro glitter is drawing me in. Silk was so promising, but it began crumbling under my finger as I swatched. So proceed with caution with this one, although I was reminded how nice a colour Suspect is, not the cold silver it looks in the pan. YDK is irreplaceable in my eyes, and Wave isn't really up to code, but nice in it's own way. Thunder was another close-but-no-cigar lacking the depth of the richer Busted. It's all there, just not enough of it. Onyx was the spanner works. True black shadow is hard to come by in the lower end of the price scale, and Blackout was for a long time my go-to blackest-black but Onyx is a pleasant surprise. It's rich, smooth and is actually black rather than a washed out grey. Well played w7, well played. Yes I was critical. But Naked 2 is a tough act to follow. No not every shade in w7 is perfect, but (bar 2) it's pretty good. Does it replace my Naked 2? No. Would I be upset if I accidentally packed the w7 on a weekend away? No, it's perfectly fine. My sister took a look at it when it first arrived (I ordered from The Cosmetic Outlet here in Dublin) and said "Yes please, I'll take one" which made me think it's a good pallet for someone just getting into makeup. Being a nerd, I compared the ingredients, and they're largely similar, although there is one key ingredient that's different which I think is the root of the difference in quality and blendability (new word). Have you tried In The Buff? Could anything compare to your most beloved Naked Palette?